The Society for the Conservation of Bighorn Sheep has developed a completely new style drinker system for desert water developments. These new systems will allow us to continue and expand our mission of desert bighorn conservation that started in 1962. In the past we have typically used rain collection systems comprised of check dams and above ground tanks. The old systems had many plumbing fittings and were prone to maintenance issues including freeze breaks and corrosion. 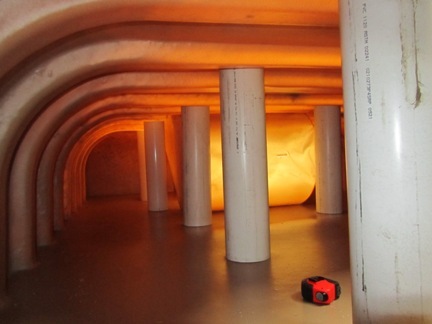 Over the years many of the original galvanized steel tanks were replaced with polyethylene tanks but the collection and distribution systems remained complicated. We tried a few different commercially available tanks but found them to be less than ideal, mostly because they were not designed specifically for wildlife water applications. Due to these limitations SCBS decided to pursue the development of our own tank design. 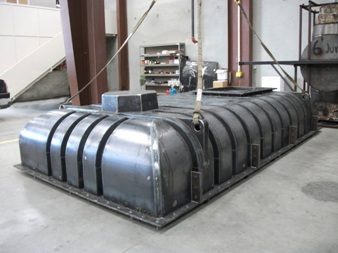 Glenn Sudmeier spent many hours developing the specifications and working with mold fabricators and the molding company to design the new tank. SCBS used funds bequeathed by the late Bob Campbell to finance the cost of the mold. 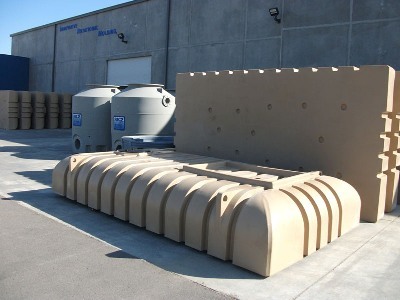 We have arranged with Innovational Rotational Molding of Madera, CA to produce the new drinker tanks using our mold. The new tanks have several improvements over those we have been using in the past. Capacity is up from 1800 gallons to 2300 while at the same time reducing the weight from 800 pounds to 750 pounds. Due to the one-piece rotational mold and 12 internal supports, the structural integrity is vastly improved allowing us to completely bury the system with up to 4 inches of soil. This reduces the visual impact as well as the potential for freezing and allows us to place the drinker directly into the top of the tank. With the drinker in the top of the tank, all distribution plumbing is eliminated along with maintenance and repair issues. Plus the water source is at ground level where it closely resembles natural water sources available to wildlife. Since the drinker is an integral part of the tank, it is enveloped by the underground water storage and the drinker water temperature is thereby moderated. The new tank has lifting lugs that are integrally molded that were developed with input from pilot Steve DeJesus to allow simple yet secure transportation by helicopter. 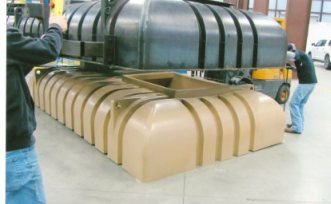 We have accomplished all of the above improvements and yet have reduced the cost per tank by about 50% – since we own the mold we don’t have to pay any royalties! SCBS has already installed 9 of the new drinker tanks at various locations. 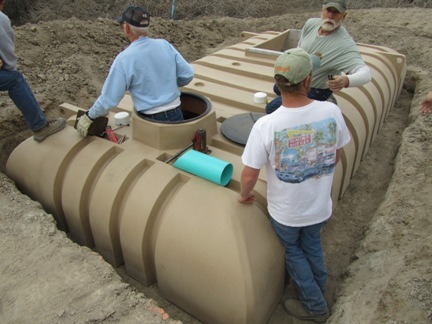 Because of the in-ground design these systems take more labor to install than above ground tanks but by careful site selection, we have been able to excavate and place single tanks with a crew of 10 volunteers in one day. We will need all of the help we can get – more volunteers equals more water developments and more water for wildlife. That means more sheep on the mountain! If you would like to help with future installations please contact me or check our calendar.